As head of an institution with 189 member countries and about $1 trillion at its disposal, Christine Lagarde has a pretty busy schedule. So you can’t be too surprised, or upset, when she shows up a half-hour late for an interview. Christine LAGARDE: I would like to apologize to you because I know we’ve been delaying and postponing. And I offer total apologies. It’s my fault. Since 2011, Lagarde has been running the International Monetary Fund. It’s been an eventful era, to say the least. The aftermath of a crippling recession; a European debt crisis and a global productivity slowdown; populist uprisings that are based, ostensibly at least, on economic distress. So we were pleased that she agreed to squeeze us in last Thursday for a 45-minute interview. LAGARDE: Can we say 40 rather than 45? Because I’m due to spend time with the World Bank, with their board, and I don’t want to offend them too much. DUBNER: Eh, they’re not so important. C’mon. DUBNER: Who would you rather spend time talking to: Freakonomics Radio or the World Bank? Let’s be honest here. 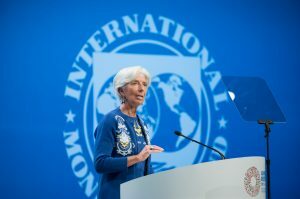 Today on Freakonomics Radio, we’ll hear how Lagarde treats I.M.F. members who don’t follow the rules. LAGARDE: We warn the authorities that this is not acceptable and that expedited measures must be taken to keep the bus on the road. We’ll talk about economic policy making and gender. LAGARDE: If Lehman Brothers had been Lehman Sisters it would be a different story. And: it takes a lot to impress, or surprise, Christine Lagarde. But it happens. LAGARDE: You know what, there is one thing that totally blew my mind. DUBNER: All right. Let’s begin — if you, would please state your name and what you do. LAGARDE: Okay. My name is Christine Lagarde and I am currently the managing director of the International Monetary Fund. DUBNER: Can you describe what you actually do in a given or typical day? LAGARDE: Okay. I spend about 50 percent of my time at headquarters here in Washington, and 50 percent of my time traveling to member countries. Because the I.M.F., the International Monetary Fund, has 189 members, that are countries, that occasionally will request my presence and I have to attend those G-20, G-7, and various meetings around the world. So any given day in Washington I would typically get up very early, at about 5:00 in the morning. I do exercise on a daily basis when I’m in Washington. DUBNER: What do you do for exercise? LAGARDE: What do I do? Well, I combine, you know, I’m multitasking, as so many women do. And I read some material that has been given to me the day before and I do stationary bicycle for about 40 minutes and then I do a little bit of other exercises. Details of which I will spare you. I finish with a bit of breathing and a couple of yoga postures that I like particularly. Then after that, shower, breakfast, things like that and I walk to the office when it’s not raining. My day at the office can be anywhere between, typically, eight o’clock until about eight o’clock, or sometimes a bit later. And I will allocate my time between meetings with teams, or with heads of department, or with the board. I do a bit of reading of materials. And I spend quite a bit of time as well on the telephone talking to either ministers of finance from different countries around the world or leaders of countries where we are trying to help and provide services. DUBNER: You were born in Paris to two professors. Your mother taught French, Latin, and ancient Greek. Your father, English literature. I also understand you were a talented synchronized swimmer and were on the French national team. So how did that person, the daughter of those professors and the synchronized swimmer, turn into the managing director of the International Monetary Fund? LAGARDE: Well, unfortunately none of my parents is actually here to see it. DUBNER: Oh, sorry to hear about that. LAGARDE: I’m sure they’d be both pleased about that. But you know, I owe it to them and to many other people along the way. But it’s certainly the love and confidence that they have given me, as well as the appetite for reading, exploring, being open to other countries and other languages. That was certainly through my father. And that you know, I am where I am — It’s a lot of hard work, a lot of determination, a lot of reading over the course of my life. And certainly the confidence to sometimes take the lead, to sometimes say yes, to sometimes say no, and try to carry the team with you along that I think is predominantly generated by the love that I’ve received. The I.M.F.’s “founding fathers,” as Lagarde has called them, were the British economist John Maynard Keynes and the American Treasury official Harry Dexter White. They wanted an institution that would promote a stable international monetary system and help create an economic network that would incentivize peace. LAGARDE: It was just after the Second World War and everybody at the time thought that it would be much better to have a multilateral dialogue rather than go to war. DUBNER: And this goes back to Bretton Woods, yes? LAGARDE: Yes, Bretton Woods, New Hampshire, 1944. NEWSREEL: At Bretton Woods, New Hampshire, delegates from 44 Allied and associate countries arrived for the opening of the United Nations Monetary and Financial conference. LAGARDE: Forty-four countries deciding that talking, sharing, opening up was better than closing down and entering into war. DUBNER: … But when we do we usually think about you in moments of fiscal crisis in some country that we probably don’t really know that much about, maybe not even know where it is, but obviously the I.M.F. does a lot more than that. You are the so-called lender of last resort; but also you monitor the economies of nation-states around the world; and you engage in what you call “capacity development.” Can you talk for just a moment about toggling between the crisis management and the kind of growth development that the I.M.F. also does? LAGARDE: Yeah. So the mission is about improving financial stability and prosperity. As a result of that, we are engaged in three lines of business. The one that you mentioned first – which is the one that we are best known for, because it’s more visible – is the lending of last resort, when those countries cannot finance or refinance themselves on the markets because the situation is very bad. And in that case we lend international community money in consideration for commitment on the part of that country that receives the loan to actually fix its public finances, take some necessary measures to restore its financial stability, and be able to yet again access markets. So, we enter into those agreements on a short-term basis with sometimes difficult measures that have to be taken rapidly, which is often called austerity. But in my view it’s more like discipline that should have been observed in the years before and that we have to help the government in place administer and implement so that the country can again become independent financially and economically. DUBNER: There is complaining of course, in retrospect, a lot of countries where the I.M.F. intervenes as a lender of last resort, often they end up being resentful of the terms that are imposed on them. As you noted, you know, you’re prescribing medicine that they should have been taking for years and they weren’t and that’s why it’s come to that. Can you talk about that tension of you, as an agency that is the backstop for countries like that, but also trying to build better practices? LAGARDE: Yes. You know, first observation is that for a program to succeed, for that discipline to be restored, it takes ownership and support by the authorities. And in many instances where that support is available and the program is endorsed and implemented by the authorities — because it’s theirs and in the interest of their population — it very often works, and it certainly works better in all circumstances. Second point there is a bit of a pattern, where shortly after the program has been completed and the situation has improved and the growth comes back and the country can go back to markets, there is a time period during which there is resentment against the, sort of, the emergency doctor that came in and said, “You really need to operate here and there and do this and that.” And then it’s followed by a realization that actually that was needed. And that resentment gradually phases out. I have seen that on the ground in Latin American countries, most of them, not all of them. I’ve seen it more and more in Asia Pacific and hopefully I will see it during my lifetime — hopefully as a managing director, who knows? — with Europe. DUBNER: But let me ask you this: Sometimes there’s, you know, bad policy or just an unwillingness to take the medicine all along, or bad practices, which may be unintentional. But a lot of the malfeasance is — well, it’s malfeasance. So let’s talk for a moment about bribery and corruption and how much that is a root cause of the problems that you eventually are called in to mop up. So you recently put the annual global cost of bribery at roughly $2 trillion, about two percent of global GDP, and those are just the hard costs, not counting knock-on effects. But additionally, as we speak, just today, you publicly announced that you’re delaying a $17.5 billion bailout package to Ukraine for failing to fight political corruption. So talk about how much of what you are addressing is kind of after-the-fact disaster created not by people who don’t quite know how to run a central bank or run an economy, and more created by a handful of really bad actors. LAGARDE: Well, there are unfortunately several instances where — surprise surprise! — we find out that such-and-such loan agreement had not been disclosed or such-and-such operation that should have involved public finance has been operated on the side in a special-purpose vehicle that has remained undisclosed. When that happens, clearly there has been either deliberate misrepresentation or convenient omittance; in that case we just suspend the program. And we say no more disbursement will be available until these issues have been cleared, until there is complete transparency and until there is a real dialogue and explanation provided to the international community through us. That happens, and I think that we as an institution committing international money, we have to be extremely firm and uncompromising about it. That’s point number one. Point number two: there are programs, and you’ve just mentioned Ukraine, where one of the key commitments was to set up an institution and to set up a court and to organize a process by which corruption would be identified, would be investigated in accordance with the rule of law and with due process, so that it could be sanctioned eventually if proven and measures been taken. When we see that these commitments are slow in the making, that there is delay that is affecting the delivery of the commitments, same thing. We warn the authorities that this is not acceptable and that expedited measures must be taken to keep the bus on the road. Absent which disbursements are no longer available. And I’m pleased to see that apparently the president of Ukraine is today taking the steps to keep the bus on the road, and we will be very vigilant. Now, the third point is we have, as an institution, always cared about these corruption issues because they are a cancer that actually cripples economies and discourage people from joining forces, contributing value, and doing the right things. And we think that this is just hurting both the financial stability and the prosperity that are our mission. And we have in particular provided a lot of technical assistance on anti-money laundering and on countering the financing of terrorism. And we have specific services, technical assistance, training made available and a very close collaboration with F.A.T.F., which is the international institution in charge of fighting that. We are going to be stronger and deeper into these issues because I’m personally — and I think the board is now supporting this — very frustrated with the fact that we engage, we enter into dialogue, we commit resources, our people work on the ground, and if it is to discover that there are undisclosed loans, that there is fiddling with the accounts, then it’s really not fair on the international community and not fair for the population and not in compliance with our mission. The I.M.F. over the decades has plenty of critics, even just among economists. Milton Friedman wanted to abolish it; he argued the I.M.F. had outlived its original mission of supporting the global monetary system. “It became,” he said in 1991, “a relief agency for backward countries, and proceeded to dig deeper into the pockets of its sponsors to finance its new activities.” And that, he said, was the mission of the World Bank, the I.M.F.’s sister institution, which was also founded in 1944 at Bretton Woods. Here’s what Friedman said: “Now you have two agencies to promote development, both of them, in my opinion doing far more harm than good.” Friedman’s point was that government was, generally, more of an impediment to free markets than a help. But institutions like the I.M.F. and World Bank also create what economists call “moral hazard”: that is, you’re more likely to engage in risky or reckless behavior when you know someone is there to rescue you. Meanwhile, economists on the other end of the spectrum — Joseph Stiglitz and Paul Krugman, for instance — they argued that the I.M.F. promoted an agenda that wasn’t interventionist enough. The I.M.F. was criticized for pushing what was called the “Washington Consensus,” a one-size-fits-all reform model promoting free trade and capital flows, deficit reduction, privatization, and the slashing of subsidies. More recently, the I.M.F.’s most controversial bailout was the Greek tragedy. It began before Christine Lagarde’s arrival but has continued to haunt the agency — and her — with the I.M.F. accused of everything from complacency and poor due diligence to demanding measures of compliance that are hopelessly unrealistic. So you can see why the I.M.F. might be eager to reposition itself as something more than the “lender of last resort,” which can feel like a lose-lose proposition. Indeed, in a 2014 speech to Latin American leaders, Lagarde declared that this is “not your grandmother’s I.M.F. !” She has stressed the importance of policy issues like climate change, inequality, and helping out the losers in the free-trade game. This means, theoretically, less bailout work and more preventive work — the I.M.F.’s second line of business, which it calls surveillance. LAGARDE: And countries commit to to each other through us to be audited, if you will, and receive recommendations that they typically should observe if they want to improve their situation. So that’s the surveillance line of business, and we do that with 189 countries. The third line of business is the one that has most recently developed and developed the fastest. And that is what is called “capacity development,” which is a bit of an obscure word, to actually describe the technical assistance or the training that we provide at the request of countries to help them manage their debt, reorganize their exchange-rate mechanisms, restore sanity in their public finance in general, collect taxation better, set up supervisory authorities that can operate on their financial and banking markets. All sorts of things that have to do with or put in place a good macroeconomic framework, have good indicators on their fiscal policy, on their monetary policy, and on the structural reforms that are helpful for them. And that is something that — it’s a bit of the hidden successful story of the I.M.F. in a way. Because I’ve been doing this job for seven years and I’ve never heard any country complain about that technical assistance or training and they always want or need more. And the beauty of it is that very often it’s financed by the rich countries to the benefit of some of the poorest countries. Coming up after the break: why women are, at least on one dimension, plainly preferable to men. LAGARDE: I believe that women tend to be more attentive to multiple consequences and developments surrounding particular issues. We’re speaking today with the managing director of the International Monetary Fund, Christine Lagarde. In 2016, she was appointed to a second five-year term. It got off to a shaky start, with the resolution of a legal issue dating back to her time in French government, during the Sarkozy administration. Lagarde was accused of giving preferential treatment to a politically connected French businessman in a case that ended up leaving taxpayers on the hook for hundreds of millions of dollars. Finally, she went on trial — taking leave from the I.M.F. — and was found negligent by the court. But she wasn’t fined or given jail time. Nor was there any accusation that Lagarde had gained any personal benefit. She went back to work at the I.M.F. with the full support of the board, as well as world leaders. A few months later, her name was even floated as potential prime minister of France after Emmanuel Macron’s election as president. It is hard to imagine any kind of top-tier short list, anywhere in the world, where Lagarde’s name would not appear. She is considered fiercely intelligent; principled but pragmatic; a serious-minded person with an impish sense of humor and an ability to make firm demands without bullying. This balance has served her institution well; the world has nearly forgotten that the I.M.F.’s previous managing director, Dominique Strauss-Kahn, resigned after being charged with the sexual assault of a housekeeper in a New York City hotel. When Lagarde replaced him, in 2011, she became the first woman to lead the I.M.F. Before that, she was the French finance minister and, before that, chairperson of what was then the world’s largest law firm, Baker & McKenzie. Lagarde was the first woman in those jobs as well. DUBNER: I’m guessing it gets tiring being asked questions about being the first something rather than questions about being the something itself. But a question regarding that: how do you believe that economic policymaking over the past century or so might have been different had there been a lot more women involved in posts at that level? LAGARDE: I happen to think that it would have been a lot different. I said once that if Lehman Brothers had been Lehman Sisters, it would be a different story. Because I believe that — and I think it’s, well certainly from my encounters of many women around the world, and I think it’s more and more demonstrated by studies and by and by analytical work — I believe that women tend to be less risk takers, more attentive to multiple consequences and developments surrounding particular issues. I think by nature, they care about the future because I guess they themselves deliver the future by way of giving birth to the next generation. And I’m not saying that women who have had children are any better than others, but I think it’s probably engraved somehow, and I disagree with those of my French favorite authors, who say that you are not a mother, but you become a mother. So I also believe that diversity brings a critical component to the decision-making process and helps check conventional wisdom. You know, when you have a room full of single gender people, there is an element of group thinking that can be hopefully challenged by having diversity in the room. So two things: one, I believe that women bring about something in and of themselves that is more precautionary maybe and more thoughtful about the future and more concerned about the next generation and what we leave behind. And I also believe that diversity procures that element of second-guessing, thinking through, debating a bit more, which is propitious to better decision-making. DUBNER: Those are interesting factors. One that you haven’t even brought up is men are responsible for the vast majority of violence in most societies around the world. And you could argue that’s a proxy for war making. So theoretically if war-making is one of the most economically costly activities we’ve done, presumably there might have been a lot less of that over the past century as well? LAGARDE: Possibly, although I used I used to think exactly along the lines of what you said. Until eventually I heard and read about those first female terrorists and female-only terrorists, which was a big let down to that to that theory that women are not attracted to violence. DUBNER: Well, no one said it was exclusively male. LAGARDE: No. You’re right. You’re right. DUBNER: I mean even if you look at kings versus queens throughout history, it does seem that we, men, are a little bit more inclined — somewhere between a little and a lot more inclined to violence. That’s all. LAGARDE: There are quite a few places where actually queens were hardly allowed, except as wife of the king. DUBNER: And it’s possible that the kind of queens who were allowed may have been necessarily warmongering queens, too. DUBNER: Let’s talk for a moment about the relationship between the I.M.F., which is based in D.C., and the U.S. federal government. So a few years ago you complained — or stated, I should say — that the U.S. had not contributed to the I.M.F.’s fund-raising, although that’s since been rectified, I understand. But additionally the I.M.F.’s positions on trade and climate change, many other issues, are almost diametrically opposed to many of President Trump’s positions. You’ve said, for instance, that — I’ll quote you to yourself — “Restricting trade is a clear case of economic malpractice.” So I’d love you to describe for me the interactions or conversations you’ve had with President Trump or his administration about any of these issues. LAGARDE: You know, what I say is very strongly based and rooted in analysis of facts, of numbers, of growth, improvement of economic circumstances, productivity, innovation and so on so forth. And we all agree that we want more growth. We all agree that productivity is too low and needs to be improved. We all agree that innovation is necessary. And when you bring that all together and you determine how much trade is or not contributing to that, you very soon realize that trade has actually been a significant factor into innovation, improved productivity, and certainly growth. And that it has combined, managed to increase income in many corners of the world, lifted hundreds of millions out of poverty — I’m sure you’ve heard that a million times — and has reduced basic costs, particularly for low-income consumers. There have been multiple studies on that front. So all of that are benefits that I don’t think many people would argue are actually costs and downside. It’s good that there are fewer people who are starving. It’s good that we are more productive. It’s good that we are more innovative and it’s good if you can buy a refrigerator or a television set for a much lower price than you had to pay some, I don’t know, 20 years ago, everything being equal. Having said that and considering that trade is a major contributor to that, we are also saying that trade has to be conducted with two components in mind. One is: is it going to benefit everybody? Or is it only going to benefit 80 percent of the population and hurt, and possibly hurt badly, 20 percent of the population? Or even 10 percent of the population? Or even 5 percent of the population? Because their factory is closing, because the supply chain is reorganized, because innovation is dislocating the way in which business was conducted. Well, those 5, 10, or 20 percent, they have to be helped. They have to be looked after and they have to be ultimately beneficiary of also that innovation, that productivity, and that increased growth. Probably through different channels than what we have had, with different education, with different adjustment principles, with support, with the ability to be mobile geographically and to move to where possibly business is being generated. Because you have as much destruction of jobs as you have creation of jobs. The gap between the two is often geography, is often skill set, and is often the ability to actually learn those new things — so that’s number one: we have to pay a much more granular attention to where the benefits fall and where the losses are suffered and focus on where the losses are suffered. The second point, which is also a must, is that trade has to be conducted in a loyal and fair way and that is the commitment that countries make to the multilateral system. If they start using unfair trade practices — I’m not talking about competition. The market is such that there is competition, but competition has to be fair. And I think that’s also something where we have probably lost a little bit sight of what constitutes fair competition? Is subsidizing electricity, oil, gas and access to finance, is that a fair way to compete or not? Depending on where you are positioned on the ladder of development. DUBNER: Yeah. but it’s interesting, is it not, that whether the share of people who are disenfranchised, whether it’s 5 percent or 20 percent as you were just ball-parking there, it’s well below the numbers that have turned out to vote against globalization in elections — or least to some degree against globalization, or the form of globalization we’ve ended up with in the U.S. and, of course, in Brexit. So let me ask: you made the point that U.K. voters chose Brexit over the nearly unanimous recommendations of economic and policy experts. You also argued that Brexit was a really bad idea, and the implication then being that its supporters are uninformed, perhaps willfully so, if all the experts say it’s a bad idea. And yet given the long and very poor record of macroeconomic forecasting, including a lot of very poor predictions from the I.M.F., along with everyone else, does it perhaps make sense for the median worker or the median voter to distrust such predictions, as Brexit supporters seemed to, and look at them instead as less of an empirical forecast and more of a kind of wish-list for the economic and policy elite? “This is the way we think the world should run,” but there doesn’t seem to be necessarily a great track record of A) predictive history or B) managing-the-disenfranchised history. I realize that was more of a screed than a question but I think you detect a question in there. I apologize. LAGARDE: Well, I’ll try to address your question and then I’ll of course I’ll defend the institution and its forecasting attempts, like everybody else’s attempts, which is: forecasting is not a mathematics science and is more an art than then something else, although there is a huge effort on the part of our teams here to improve and refine. But there are totally unpredictable events and there are things that we simply do not understand, which are related to human nature, with behavior, as the Nobel jury has recently acknowledged by celebrating and acknowledging the contribution of behavioral economists. But back to your question, which I think is a really interesting one, and where I really want to comment as myself and not as representing the I.M.F. I am not sure that those economic issues actually mattered that much. And I’m not inventing anything or I’m not being particularly innovative because I’ve tried to understand and I’ve read a lot about what was happening in the U.K. or possibly the U.S. votes, but more the U.K. I think what was more at the root of some of the votes was the issue of the foreigners, the immigrants, the guys who are coming from somewhere else who are not “us.” And there were towns where people said, “I want Brexit because I don’t want foreigners and I don’t want those immigrants to actually take over or be here or take services that are available.” So there was certainly that perception that the culture, the language, the history, the roots, that sort of heritage that people care so much about, and we all do, wherever we are and wherever we live or travel, was sort of vanishing because of the coming in of different nationalities, different languages, different religion maybe. And that fear of the other I think had a lot to do with the way in which the vote was taken. So, yes, the economic circumstances also mattered. But I think it’s a multifaceted explanation. And frankly I do not see a dichotomy or a disconnect between opening borders and letting goods and services and capital move under fair circumstances and and on the level playing field, on the one hand, and being attached and cultivating language, civilization, heritage, history, as is part of our identity. DUBNER: . I realize we’re just about out of time. This is a short one. What’s something that you believed to be true for a long time until you found out that you were wrong, or if you don’t like that dichotomy of right versus wrong, what’s something significant that you really changed your mind about over time? LAGARDE: That’s a difficult one. DUBNER: As it was intended. LAGARDE: You know what? No, there is one thing that totally blew my mind. No, seriously. And I’ll go back to women and to gender. I could not believe a study that was produced by our department based on the legal systems of about 150 of our member states. A very thorough study of a constitutional and legal system, where the result of it was that 90 percent, nine zero, of those 150 member countries had actually embedded in either their Constitution or their legal system, discrimination against women. And not the teeny-tiny, totally irrelevant, or trivial discrimination, which even as such would be unacceptable, but major discrimination. I just couldn’t believe it. DUBNER: And you as a lawyer — trained as a lawyer, not as an economist — you’re saying you never would have predicted that, had you not known? LAGARDE: No, no. I would never have thought that it was actually. If you look at it 140 countries around the world have discrimination against women embedded in either their Constitution or the legal system in a significant way that actually causes women to be either deprived of land, of title, of heritage, of bank account, of being able to collateralize something and be actual economic contributor and satisfied human beings, if they want to contribute economically. DUBNER: And at what rate are those restrictions being revoked or overturned? LAGARDE: Laboriously! But I make the point as much and as often as I can. So I’m glad to finish with that. DUBNER: Yeah. Madame Lagarde, it was an honor to speak with you and I thank you for the time. LAGARDE: Thank you so much. Coming up next time on Freakonomics Radio: the story of a market where supply and demand have a really hard time meeting. But there is a way to help find a kidney for people who need one. It’s such a clever solution that its inventor won a Nobel Prize. “Make Me a Match” — that’s next time, on Freakonomics Radio. CREDITS: FREAKONOMICS RADIO is produced by W-N-Y-C Studios and Dubner Productions. This episode was produced by Greg Rosalsky. Our staff also includes Alison Hockenberry, Merritt Jacob, Stephanie Tam, Harry Huggins, and Brian Gutierrez; we also had help this week from Dan Dzula. The music you hear throughout the episode was composed by Luis Guerra. You can subscribe to Freakonomics Radio on Apple Podcasts or wherever you get your podcasts. You should also check out our archive, at Freakonomics.com, where you can stream or download every episode we’ve ever made – or read the transcripts, and find links to the underlying research. You can also find us on Twitter, Facebook, or via email at radio@freakonomics.com. Did Lobbying Contribute to the Financial Crisis?